What Jake Muzzin Brings to the Leafs - The Point Data-driven hockey storytelling that gets right to the point. There’s a pretty good chance the Toronto Maple Leafs path to the Eastern Conference Final and ultimately the Stanley Cup will have to go through Boston and Tampa Bay. The Leafs acquisition of Jake Muzzin was a calculated move to address deficiencies in the team’s defensive game, often exploited by those very teams – the cycle and net-front coverage. Kyle Dubas said, “Defensively, I thought it was a great fit for us.” Here’s why. Muzzin is a big defenseman who can play all situations and is effective in all three zones. He has an active defensive stick and uses it often to break-up cycle plays. 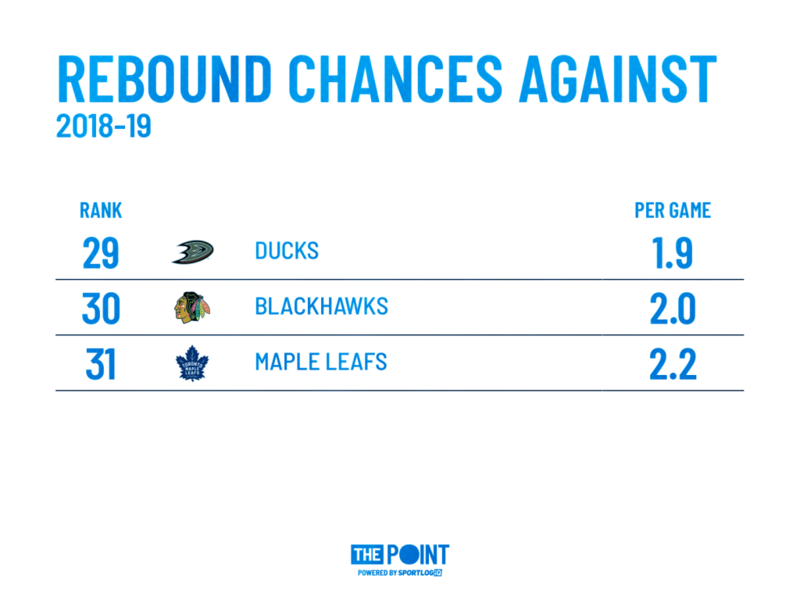 Here are some examples of him doing just that followed by a graphic that shows why this element of his game will be so valued by the Maple Leafs. The Leafs have a tough time in their own end preventing quality chances once the opposition starts whipping the puck around. Muzzin helps here. 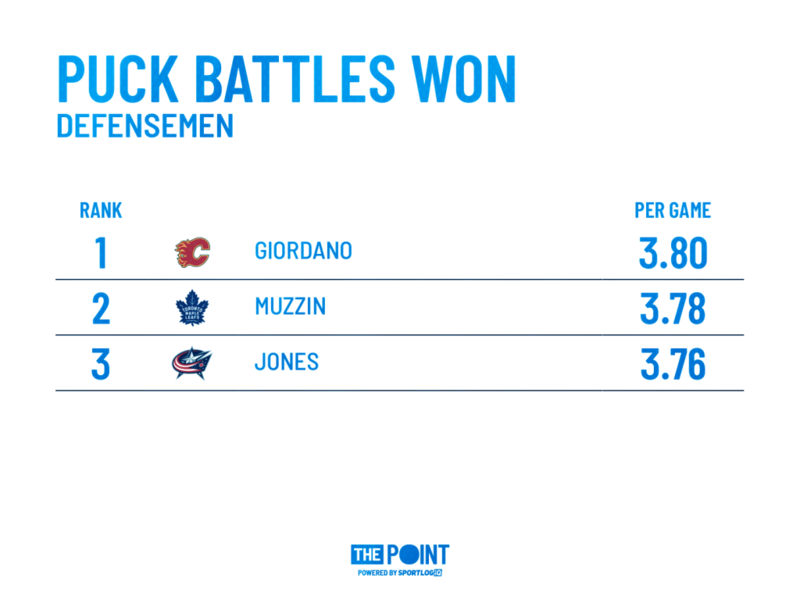 Fun fact, Mark Giordano is the only defenseman in the league who wins more puck battles, per game, than Jake Muzzin. Muzzin effectively uses his 6’3, 213 pound frame to push attacking players off the puck and out the way in front of the net. 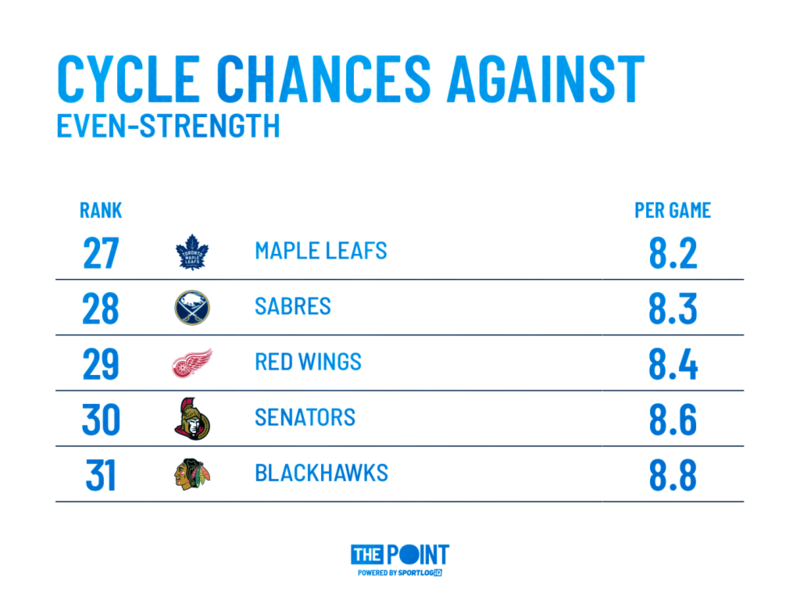 Again, this addresses an area of need for the Leafs, who allow more scoring chances off rebounds than any team in the league. Net-front defensive zone coverage in general has been an issue for the Maple Leafs for much of the season. Their goaltenders are underperforming on screened shots, which we touched on recently. Muzzin will be the Maple Leafs most physical defenseman without being just a physical defenseman. He makes a good first pass, which, for a team that attempts more stretch passes than anyone, is a prerequisite in Toronto. Cutting down cycle chances against and scoring opportunities in front of the net is what we can expect now that Muzzin is a Toronto Maple Leaf. I’ll revisit this in a couple of weeks to provide an update. However, like any player, it’s not all sunshine and roses with Muzzin. Muzzin turns the puck over on 17 percent of his possessions. So, for every 100 times he touches the puck, his team loses possession of the puck 17 times. That ranks him 5th out of the Kings 6 most used defensemen and would rank him 5th on the Maple Leafs. Muzzin’s defensive zone turnover rate also ranks 5th on the Kings and would rank 5th on the Leafs, right now. It’s important to note, the Kings rely on short passes in the defensive zone when breaking out, while, as mentioned, the Maple Leafs attempt more stretch passes than anyone. Very different breakouts. It will be interesting to see how Muzzin adapts in this area. Bottom line, the Maple Leafs addressed a big-time need on the blueline and they didn’t lose a roster player in the process. This is a homerun trade by Kyle Dubas and the Maple Leafs front office. I’d still be hesitant to call the Maple Leafs favourites in a playoff series against Boston or Tampa Bay but, they are better than they were 24 hours ago and there’s still a few weeks to go before the trade deadline on February 25th.